These common wooden pallets have remained our best companions throughout our wooden pallet recycling journey. We have employed them in numerous pallet wood recycling ideas where they earned us a lot of respect and fame in front of our fellow users and subscribers. 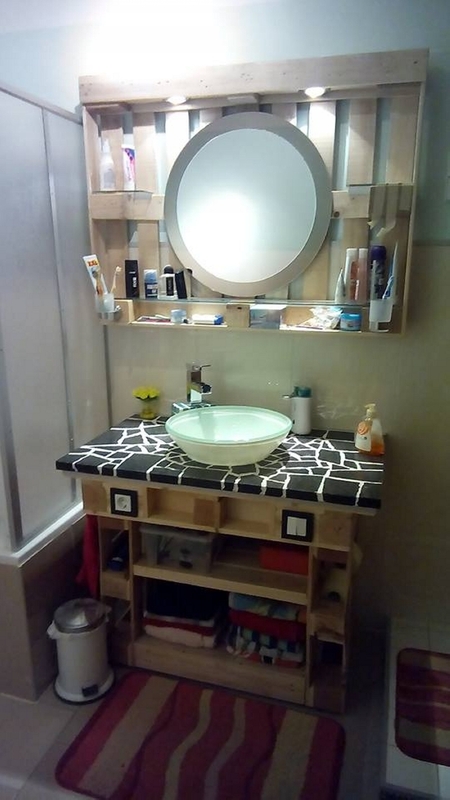 So we just thought to give it a new dimension, in the earlier projects our main focus has remained on some practical wooden pallet furniture items, but here in this article we are going to present you a gorgeous plan of using these wooden pallets in bathroom decor, sound pretty good? it is great infact. 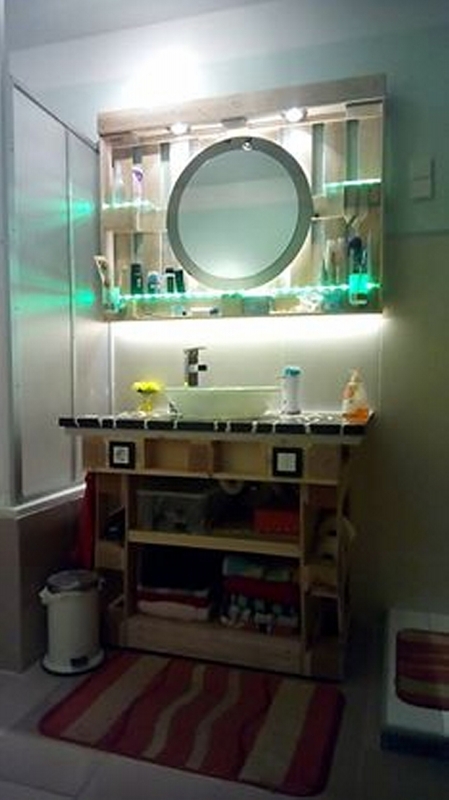 Look at this wooden pallet installation in the bathroom. 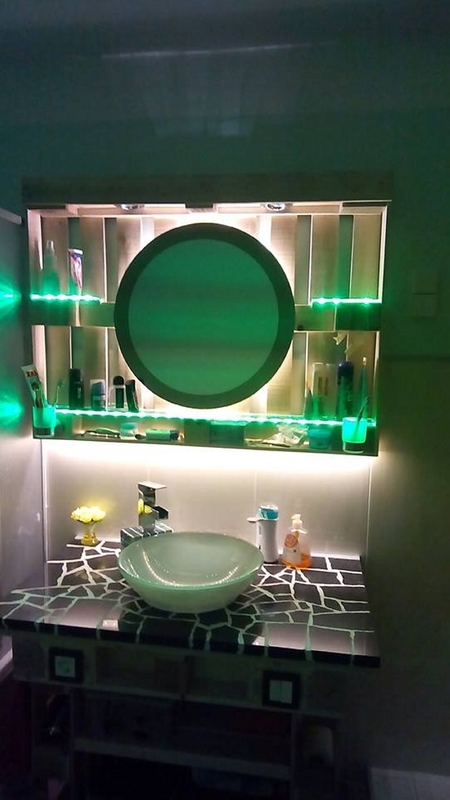 You could have used a simple conventional bathroom mirror stand along with a common bathroom cabinet where you put your several accessories like shampoo, lotion, soap etc. But as we promised, we are giving the wooden pallets a new direction. This time we are using them in the decoration of your bathroom. Look at this awesome mirror stand made using the raw pallets, before installing a circular common mirror, we have set a stage using the pallets on wall, and we have equipped it with several wooden slabs that you can use to place some accessories you need in your immediate access. 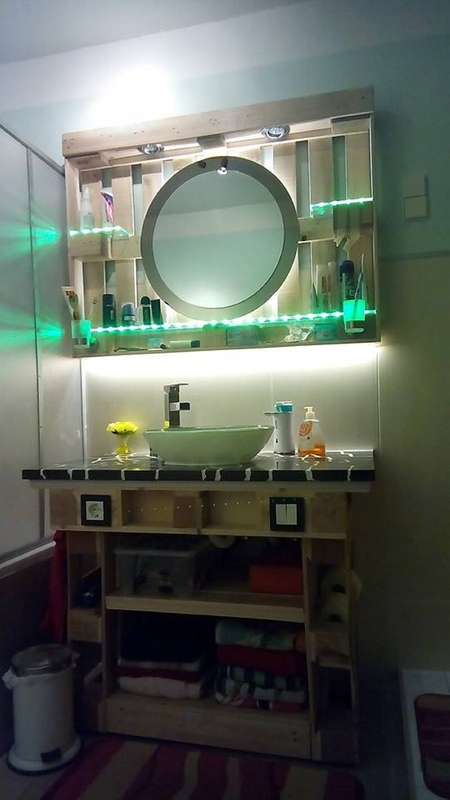 Then we have installed a number of tiny lighting tubes inside the pallet installation, the green color of lighting tubes is adding a lot of charm to the bathroom. And the additional wooden shades and slabs are fixing the issue of your storage space inside a congested bathroom. And finally have a look on the wooden cabinet right below the pallet mirror stand, it is a huge wooden pallet cabinet for your bathroom having multiple cabins and drawers which are just more than enough for all your storage needs. These bathroom decor ideas are just making me nuts and crazy.